Late summer tomatoes. From your very own garden. Planted by your own dear spouse. Handpicked by your very own hands. Is there anything better? You want to do something very special with them. You want to showcase the freshness of these rare gems. What to do? Well in our house there is absolutely no contest. We made Grandma Bayly sandwiches. Sheer bliss. A sandwich so pure and so good that it literally leaves you speechless. My dad’s mother used to make these for him when he was little. I never met her. She died long before I was born. But I know what an amazing woman she was. I know stories upon stories about her. I know she taught my mother her love of cooking. And even though my mother died when I was a young girl, she taught me my love of cooking. Elaine knows of what I speak. Jenny knows of what I speak. A part of our heritage, these Grandma Bayly sandwiches. So I didn’t even hesitate. 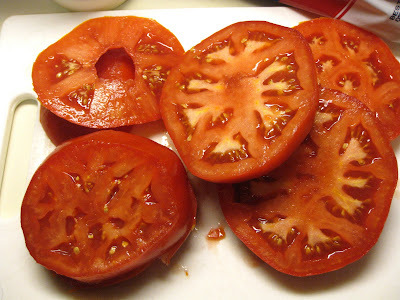 I made salsa with the smaller tomatoes, but these beauties were reserved for the piece de résistance…Grandma Bayly sandwiches. They are quite simple, really. And many of you may make them and call them something else. You’re allowed. Take your bread; white is traditional, however some (i.e. Jenny) will blasphemy and use whole wheat. I let her get away with that little faux pas. Toast the bread and spread it with real mayonnaise. 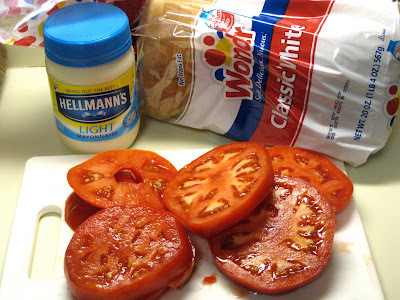 Place a thick slab of tomato on, and top it with another piece of mayonnaise toast. You may salt the tomato if you are so inclined. And that is it. A masterpiece! Caution: The first bite will induce moans and swooning. You may want to sit down before engaging the sandwich. Note: I am aware of the absence of photos of the finished product…Bob and I simply lacked the self control to wait long enough to take pictures. I make no apologies. Because they truly are that good! Just ask Elaine & Jenny. Great post. Gorgeous pics. I found you from your comment on the Kitchen Widow's post about Columbus food bloggers. That sandwich sounds incredible - with the exception of light Hellman's. I would go full fat!